A recent study from ESA’s Mars Express and NASA’s Mars Reconnaissance Orbiter (MRO) provides new evidence for a warm young Mars that hosted water across a geologically long timescale, rather than in short episodic bursts – something that has important consequences for habitability and the possibility of past life on the planet. Although water is known to have once flowed on Mars, the nature and timeline of how and when it did so is a major open question within planetary science. This finding is part of a series of efforts to understand Mars’ history and the planet as a whole, performed using Mars Express and other spacecraft – from studying Mars’ early climate by probing the evolution of large lakes that once existed across the planet’s surface, to observing Mars’ present-day weather (including mystery clouds and aurorae), and characterizing the pockets of magnetism locked up within its crust. The detailed geological map of the intercrater plains north of the Hellas basin shown below was produced by Francesco Salese and colleagues using images from the Mars Express High-Resolution Stereo Camera (HRSC), the Mars Reconnaissance Orbiter (MRO) High Resolution Imaging Science Experiment (HiRISE), and Context (CTX) camera. 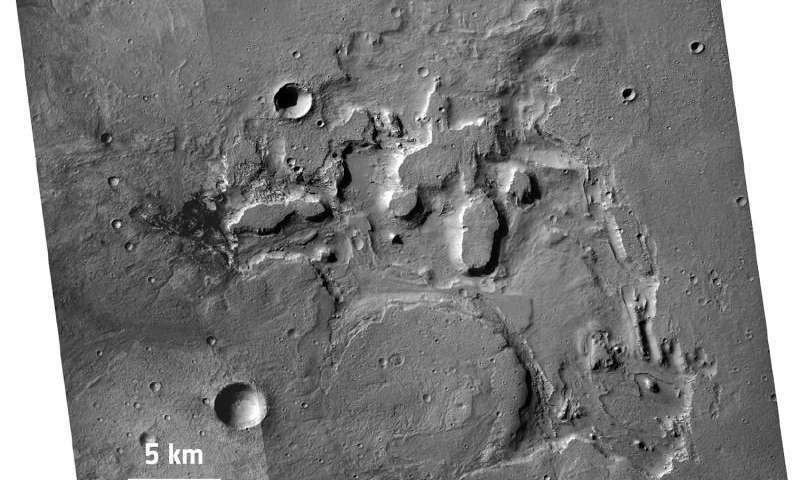 The data from Mars Express and MRO allowed the scientists to explore the region’s appearance, topography, morphology, mineralogy, and age. 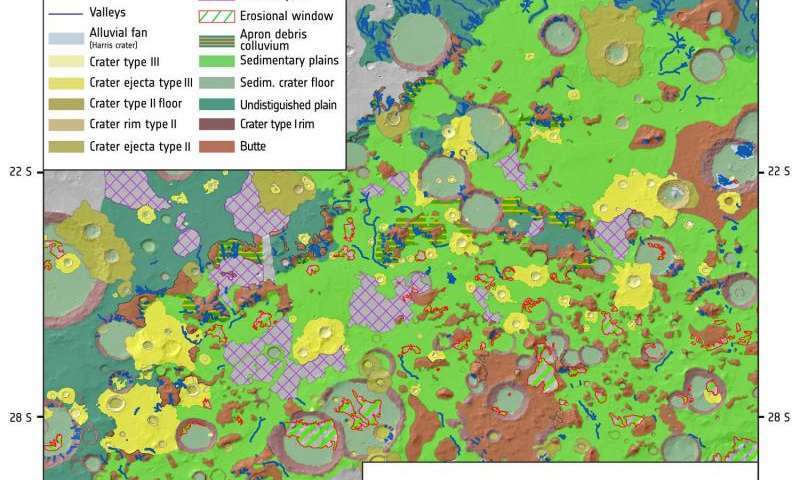 More specifically, Mars Express imaging data allowed them to study the plains’ geology on a regional scale, providing context for the local-scale observations from MRO. 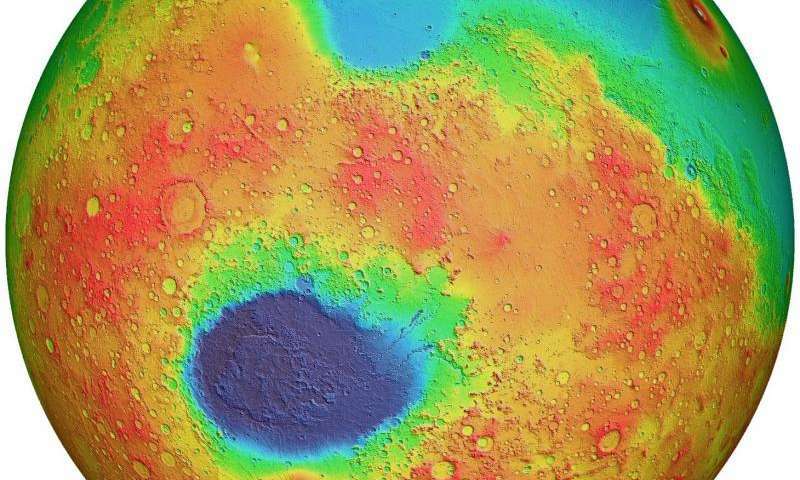 Analysis of the map provides new evidence for a warm young Mars that hosted water across a geologically long timescale, rather than in short episodic bursts – something that has important consequences for habitability and the possibility of past life on the planet. These data showed the plains to be composed of an over 500-meter-thick band of flat, layered, light-colored rock. The rock showed several characteristics typical of sedimentary deposition: box-work, which is a type of box-like mineral structure formed by erosion; cross-bedding, identified as layers of rock intersecting at different tilts and inclines; and planar stratification, which manifests as distinct, near-horizontal layers of rock that line up atop one another. These were in addition to large amounts of clays known as smectites. The rock then underwent an intense period of volcanic erosion during the Hesperian period (3.7 to 3.3 billion years ago) and was covered by volcanic flows, creating the morphology we see today. The scientists estimate a minimum erosion rate for this time period of one meter per million years – one hundred times higher than the erosion rates estimated on Mars in the past 3 billion years.